Gates J, Peifer M (2005) Can 1000 reviews be wrong? Actin, alpha-Catenin, and adherens junctions. Cell 123(5), 769–72. Perez-Moreno M, Fuchs E (2006) Catenins: keeping cells from getting their signals crossed. Dev. Cell 11(5), 601–12. Fox DT, Peifer M (2007) Cell adhesion: separation of p120's powers? Curr. Biol. 17(1), R24–7. 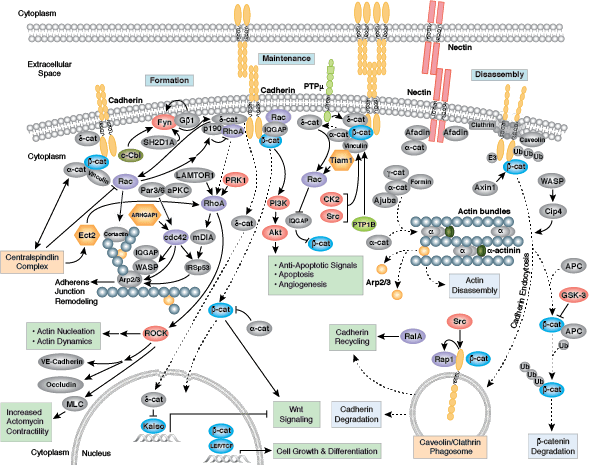 Yap AS, Crampton MS, Hardin J (2007) Making and breaking contacts: the cellular biology of cadherin regulation. Curr. Opin. Cell Biol. 19(5), 508–14. Niessen CM, Gottardi CJ (2008) Molecular components of the adherens junction. Biochim. Biophys. Acta 1778(3), 562–71. Nelson WJ (2008) Regulation of cell-cell adhesion by the cadherin-catenin complex. Biochem. Soc. Trans. 36(Pt 2), 149–55. Schmalhofer O, Brabletz S, Brabletz T (2009) E-cadherin, beta-catenin, and ZEB1 in malignant progression of cancer. Cancer Metastasis Rev. 28(1-2), 151–66. 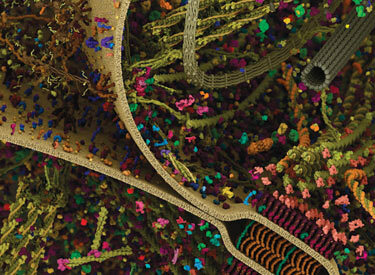 Meng W, Takeichi M (2009) Adherens junction: molecular architecture and regulation. Cold Spring Harb Perspect Biol 1(6), a002899.